The Geek Culture Forums! : Me thinks we are going to have Fawns!! » The Geek Culture Forums! » News, Reviews, Views! » Your News! » Me thinks we are going to have Fawns!! Author Topic: Me thinks we are going to have Fawns!! Along the East edge of our farm there is a doe acting different than normal. 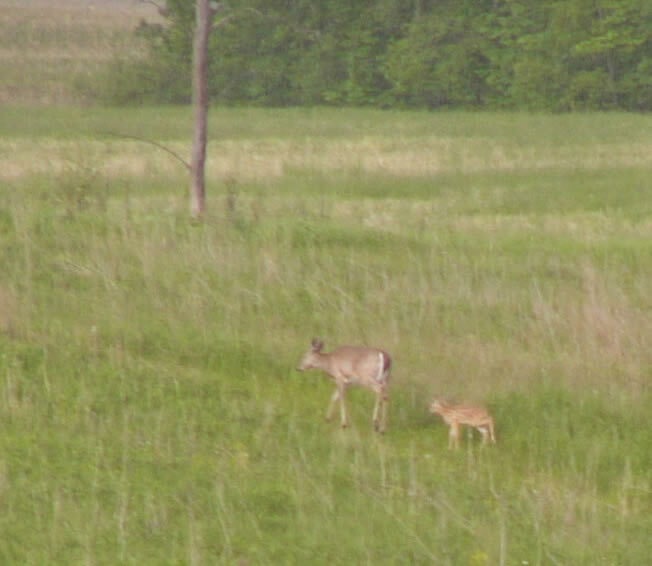 We usually have Fawns around in June and I know by then they are a couple of weeks old. The Doe has picked a spot along a ridge that offers good visibility in all directions. Middle of the morning and she is lying down? Usually they are feeding now. I wish I had a camera with a longer lens. She is about 750 feet away. Camera question?? I have some good K-mount lenses 50MM 2.8F. 70-210MM 3.9F. 500MM 4F. Has anyone used this Camera?? film body. You may need it if she moves around a lot. HalfVast About thirty plus years ago I bought a Ricoh KR30sp the three lenses, an auto winder, and strobe. Now I am getting tired of film, and was thinking of using those lenses. That combo you recommended is way less than I paid back then. Update not really, I have not seen the antlerless deer since I first posted. She is back and looking quite plump, more to follow. Most of the day I was getting ready to have an active evening storm watching (SKY WARN). Then two Canadian Geese walked through the field from where they landed in the corn field to the old mans pond, distance is about a 1/4Mile of high weeds, yup they walked through. I have heard that birds do not like to fly during a Barometer drop. but this was pretty extreme. Then we spotted the Doe with a Fawn. I will try to get them posted. Then the storm came, lots of rain, wind. We were on the North side of the cell track, meaning I could not get a good view, wish I had been on the South side usually dryer there. No harm done in our county and the storm cells passed out over the North edge of the Saginaw Bay.